Aircast Cryo/Cuff For Hand and Wrist with Cooler (Non Motorized Kit),Provide cold therapy treatment to Hand and Wrist to relieve swelling and pain post surgery. Use cryo therapy to heal pain faster. Aircast Hand and Wrist Cryo/Cuff is designed to give maximum relief from swelling, inflammation, pain and swollen joints. Cooling effect helps ease the pain. The design allows to position the cuff to get as much hand covreage as required. Additional support bars are there in the cuff which are removable if wider range of motion is required. It comes with a cooler and a cuff. 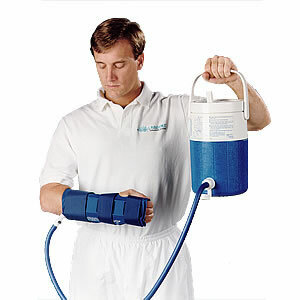 Hand and Wrist Cryo/Cuff can be ordered alone or with a cooler. The cooler can also be purchased as a separate assembly and can be used with any Cryo/Cuff model. Aircast Hand & Wrist Cryo/Cuff by DJO Canada is used to provide cold treatment to Hand and Wrist to relieve swelling and pain post surgery. The design of cuff provides complete protection to hand & Wrist. Features support bars for extra support and can be removed if wider range of motion is needed. Can be ordered seperately or can be ordered with a cooler. Cooler includes tube assembly and insulation disk. Can be used with any Cryo/Cuff model. Easy to use but should be used with guidance of a health care provider. Is available in one Universal Size. My friend slipped and broke her hand. I rushed her to hospital and doctor recommended this product. I bought it for her and she liked the soothing effect of the cooler. She is feeling much better after using this. Aircast braces are just wonderful. This wrist brace just worked perfect for my son who is into sports and was devastated after his injury. With this brace, he recovered completely and is back to his game now. All thanks to this amazing product. I was diagnosed with wrist arthritis and there was extreme pain in my wrist. My hand and wrist were badly stiff, was unable to move them properly. My doctor has suggested me to use this hand/wrist cryo cuff. I am using it from last one month and I am so relieved. It worked amazingly. The brace provides compression to minimize swelling and the cooling effect minimize the pain. I am able to move my hand and wrist properly. I wish I could have used it earlier. I had a wrist fracture. Due to which blood vessels were damaged resulting in swelling and pain. There was stiffness too. I was unable to stretch or move the wrist properly but there is so much relief after using this product. It is a versatile cuff which not just reduced the pain but worked on swelling too. There is no more stiffness and now I can move my wrist with more ease. I am a cricket player and spend several hours on ground but from last one month, I was unable to play as my wrist got sprained. It swell badly and there was a severe pain. My doctor recommended me to use this cryo cuff. It has the magical cooling effect which minimized the pain and there is no more swelling. I am happy that I am back on ground. Thanks to this wonderful product. I have used this splint for my sprained wrist. I am very satisfied with the product as it worked well on pain and swelling. Earlier, I find it hard to move my wrist but with the regular use of cryo cuff, I am doing daily activities without any discomfort. Best product for wrist sprain and injury. I met an accident last month. Due to that, my wrist got sprained and swollen badly. I was not able to move the wrist and there was a killing pain in my wrist. Finally I got relieved after using this cryo/cuff which works both pain and swelling. I feel comfort while twisting the wrist. I work out regularly and my wrist got twisted while doing hand exercise. There was severe pain in my wrist and I was not able to bend my wrist. This cryo cuff worked for me. Its cooling effect minimizes the inflammation and pain. There is a significant improvement in my wrist.